So far the Kids Corner forum has been working pretty well, but there are still a few problems. Since it is a Registration Only message board, the Moderators have to approve new accounts. For some reason, the "Account Approved" emails that are generated sometimes give misinformation. For example, you might be told that "your account has been disabled by a staff member" or some other such message. Please be confident that this is not the case - often we never find out what the problem was. We have managed to get some members registered after trying many different things - deleting the account and trying over and over finally worked. If you have a problem with your account, please send an email to Kath. That is the only way you will get any results. Any other problems with the forum, let us know! Happy Halloween from JC World! 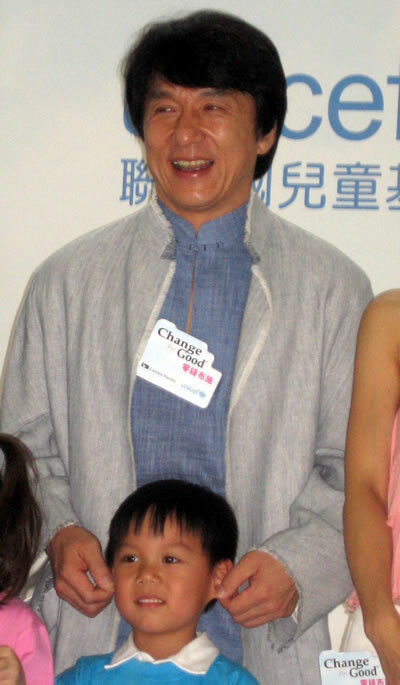 Wow - Jackie Chan Pumpkin! 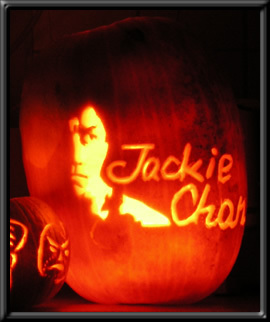 Thanks to the fan who sent in the great photo of the Jackie Chan Pumpkin. Sorry that we don't know who you are - your email was deleted and the photo was saved. Please let us know who you are so we can thank you properly. Last Day for Halloween Entries! Today is the last day to send in your designs by email. If you have sent your designs by REGULAR mail and do not see them posted yet, please email Kath. We will wait a little longer for those coming by regular mail. 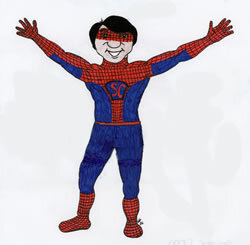 CLICK PRISCILLA'S "SPIDERCHAN" TO SEE ALL THE NEW DESIGNS! We're just about at the end of the Halloween Contest. But don't worry if you sent your designs in by regular mail - we'll give it a few extra days because we know the mail can be slow. For now, enjoy the newest entries. CLICK HERE TO SEE ALL THE DESIGNS! Look Who Stopped in to Visit! Here is where Animal stays while Kath is busy working. 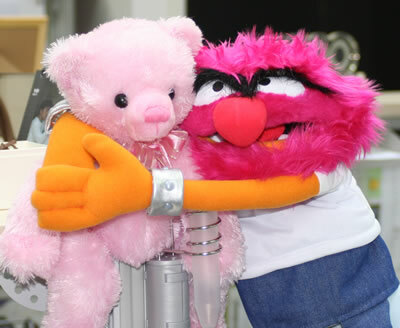 Here's Animal with Jackie's bear from the Walk With Pride Fashion Show. Animal is very sneaky, and when no one was looking he went visiting through the JC offices. Her dog Jackie, that is. Of course those who know Serena know that she's also a big Jackie Chan fan. Could that be why she named her dog "Jackie?" 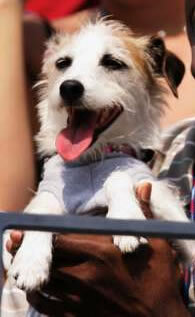 Jackie Williams watches Serena at a recent tennis match. 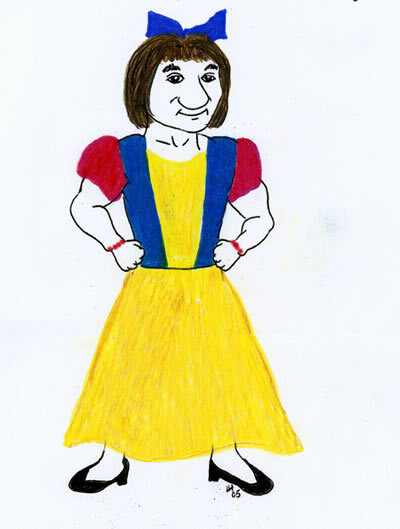 Click on Snow White to see all the new designs! Just to prove that it's important to check your SPAM mailbox, here's a Buddy Bear that was hiding in the old Kids Corner SPAM mailbox since June! Apologies to Scott for not posting his beautiful Buddy Bear sooner. Click Scott's Buddy Bear to see all the fabulous designs! Check out World Smile Day's website here. 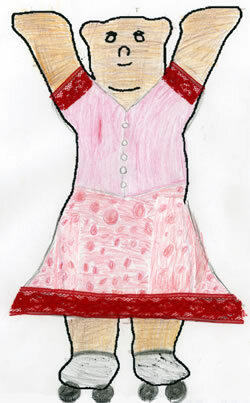 Click on Isabela's cute portrait of Jackie to see more! 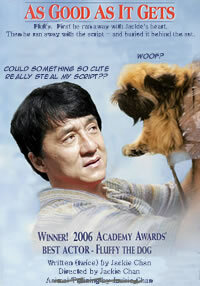 Jackie Chan "Movies That Weren't"
Jackie's always thinking of clever new ideas. Click the banner above to read about his latest! This little girl was in the right place at the right time and had her photo taken with Jackie. Lucky girl! Jackie's Tire Changes Faces Again! Check this out! The "Back to School" sign has been replaced with The Myth announcement. So what do you think will be next? Click Jackie to see the newest card! 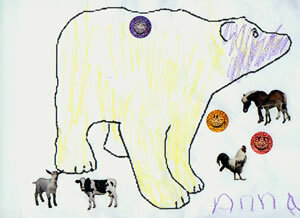 Terrific Drawing by a "Big Kid"
Patrick Kirkby sent this drawing into the Kids Corner. 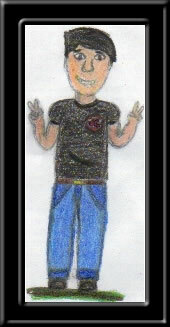 Although he's a "big kid," we are happy to post his drawing and thank him for sharing it with us! 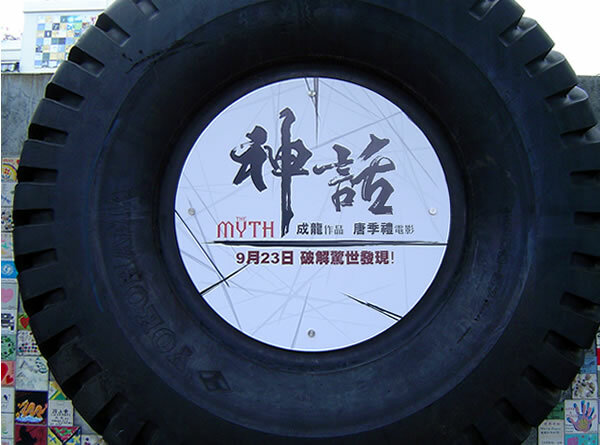 Tonight is the Charity Premiere of The Myth in Hong Kong. Tomorrow (September 22) is the Hong Kong Gala premiere and thenThe Myth opens all over Asia on Friday! 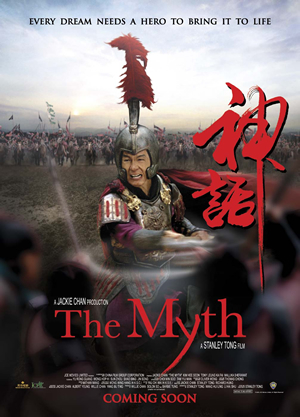 Be sure to check back here soon for a movie review of The Myth. 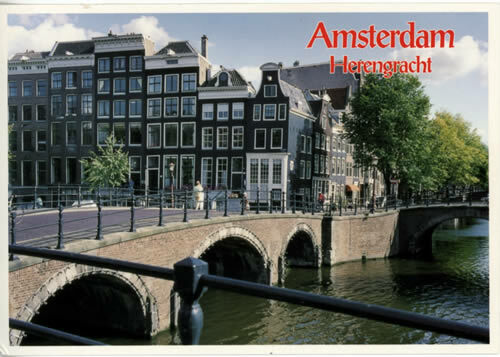 Thanks to Yuris from Amsterdam for sharing three beautiful postcards! Click here to see them all. Click on the photo above to read about Kowloon, Hong Kong. A Few Buddy Bears Have a Great Adventure! 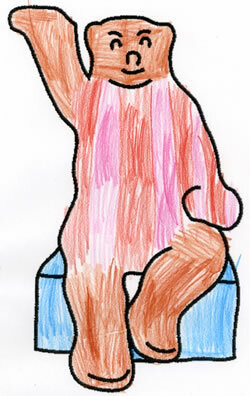 There are some new Buddy Bears posted here at the Kids Corner and they have quite a story to tell! They were created by some little girls in Australia and their mom sent the bears to the Kids Corner in New York. They arrived there just before the Kids Corner webmaster moved to Hong Kong and they got lost in the shuffle of moving. Amazingly, they were discovered recently (they were hibernating on a bookshelf in Hong Kong!) and now they've made their way to the Kids Corner. Thanks to Katie, Sarah, Helen, and Megan for their patience. Click on Sarah's Buddy Bear to see all the new ones. Tons of Terrific Photos from Shanghai Charity Concert! CLICK HERE to see over a hundred photos from the Shanghai Charity Concert. 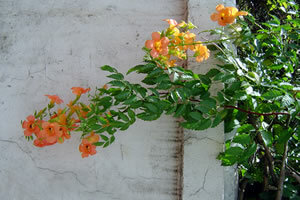 All photos can be clicked on and enlarged. To get to the next page of photos, just click on the numbered link at the top of the thumbnail pages. 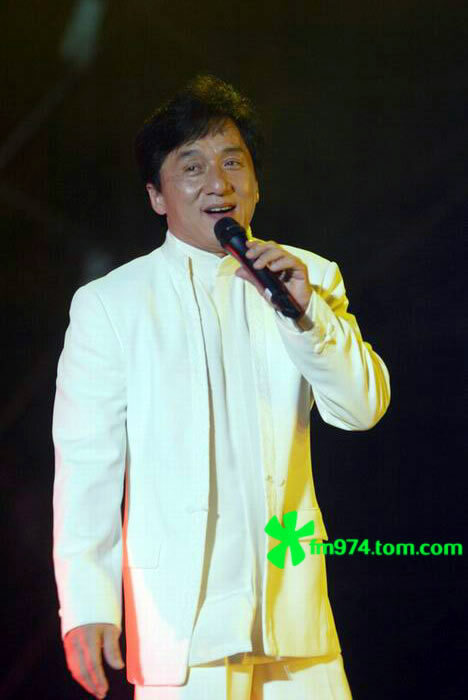 Here's a photo of Jaycee performing at the Shanghai Charity concert. 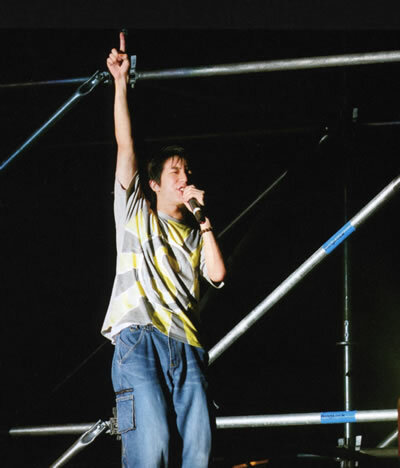 He's a terrific performer and the fans really appreciated him. Jackie loves getting postcards from fans all over the world! Click Jackie to see the newest ones. Click on the photo to read the update. 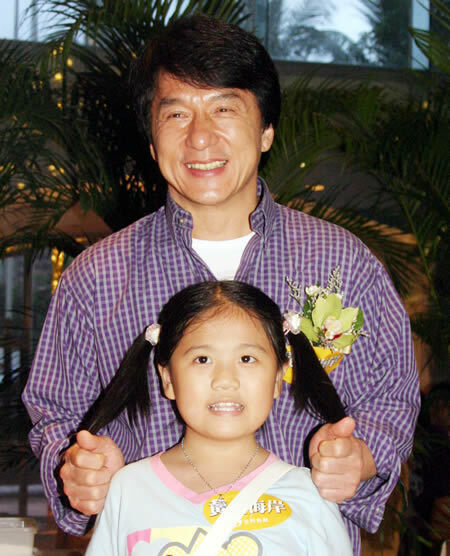 In Jackie's diary last month, he talked about a little girl who donated all her savings to help other children. When her friends saw what she'd done, they too donated money. Jackie said, "This is what I mean by leading the way, because if there wasn't someone leading the way, the children might not have done what they were doing." Well, when Jackie hears about what Alec has done (you have to read the story update to find out!) he will be overjoyed because this is exactly what he was hoping would happen. When one person starts something good going, others will follow. Congratulations to Alec for being a true Jackie's Kid! Click on his photo above to read the update! Jackie's Message for School Kids! 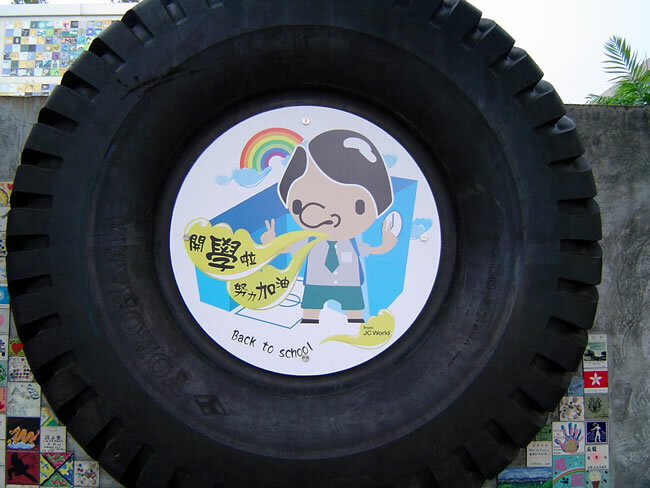 Some of you will recognize the giant tire outside Jackie's Hong Kong offices. 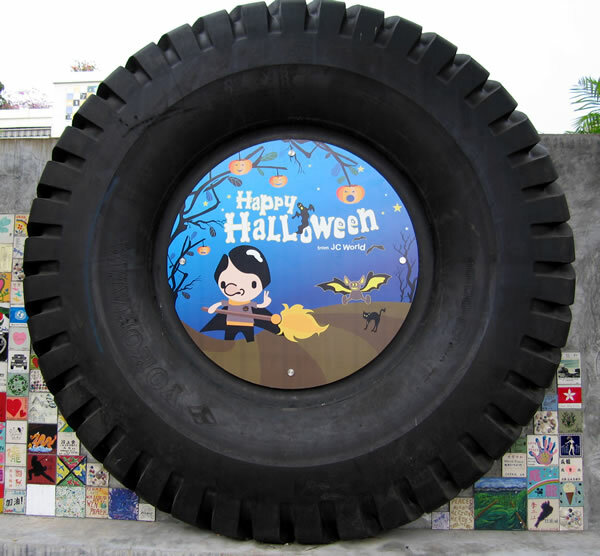 He has begun a tradition of changing the inside decoration of the tire for different holidays. The last one displayed was for Father's Day. The Chinese reads: School's begun - work hard! Buddy Bears Keep Getting More and More Creative! Just when it seems that all the ideas for Buddy Bears have been done already, a new pack of Buddy Bears arrives and WOW! They're completely original. Thanks to Priscilla and Shyanna for their great designs. And thank you to Priscilla, age 14, who also sent in a VHS copy of Jackie's "Fantasy Mission Force" movie and a bag of microwave popcorn. Thanks Priscilla! Click on Anna's Buddy to see all the new ones. 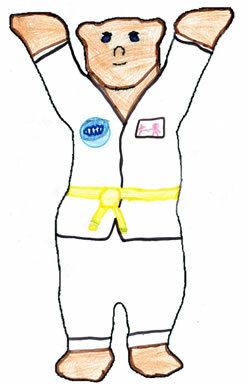 Click here to see a new addition to Jackie's Coloring Pages. It's been a while since someone has sent in a postcard and one arrived just today at the office. 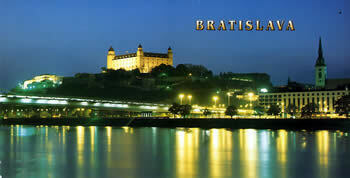 Thank you to Heidi who sent this postcard from Bratislava. If you have sent in a postcard and did not see it included in our postcard pages, please drop the webmaster a quick email and she'll see if she can find it. If you've NEVER sent in a postcard, why not do so right now? There are many countries missing from our "Postcards From the 'Hoods" section of the Kids Corner! Here is a new Myth trailer - in English! Click on the poster to see it. You should use Windows Media Player Version 10 to view this trailer. Click here to download version 10. 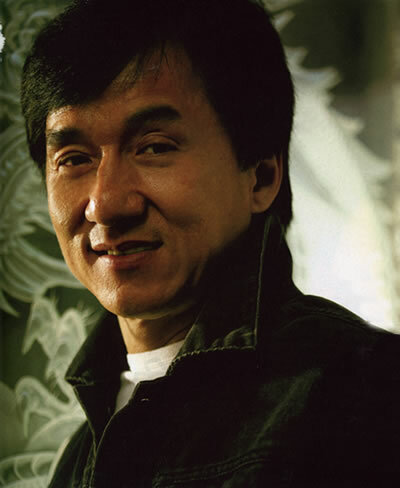 Jackie feels very strongly that people should learn about Chinese culture and heritage. Why not take a look at some of the places in Jackie's hometown? 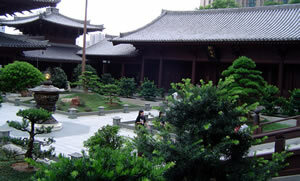 Click the photo to read about the Chi Lin Nunnery in Hong Kong. 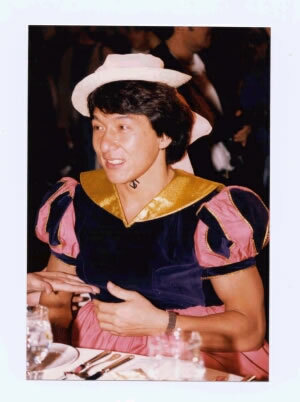 Why Do YOU Love Jackie Chan? 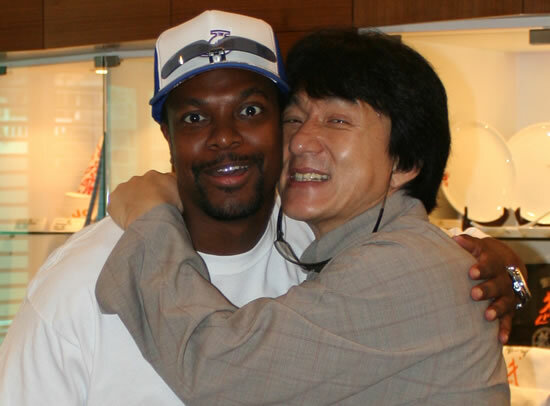 Recently someone asked the question, "What do you love about Jackie?" on the Kids Corner Forum. The range of answers was amazing! 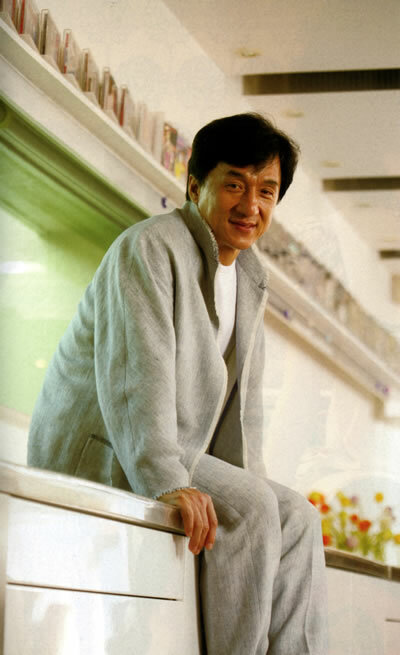 Many people mentioned Jackie's kind and caring heart, and more than a few mentioned that he was cute! 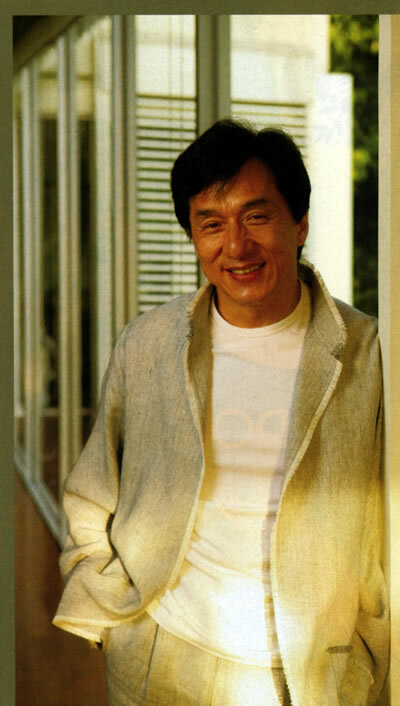 Click below to have a look for yourself at some of the reasons that Jackie's fans adore him. Many people lost their homes and families in the Asian tsunami. People from the Hong Kong Entertainment Industry tried their best to help the survivors, especially Jackie, who donated more than $HK 1 million. A girl and boy in America were influenced by Jackie's good deeds, and they became "charity ambassadors" and are raising money for the victims. 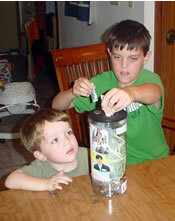 The kids asked for help to gather photos of Jackie's visits to the disaster areas. They made a photo album [poster] and asked people to donate money for the victims. 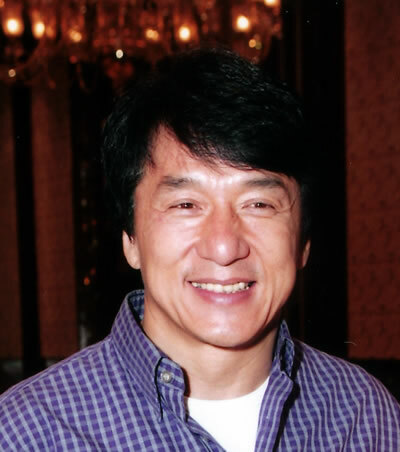 Jackie was very happy to hear this news from UNICEF [this was a mistake - Jackie saw the featured children on the Jackie Chan Kids Corner website]. He said, "I feel very touched and happy. Actually I just try to help people who are in need; I don't expect the next generation will learn from me! It is really an encouragement to me and I feel more confidence to do more charity work in the future." Rush Hour 3 Stocks Rise! 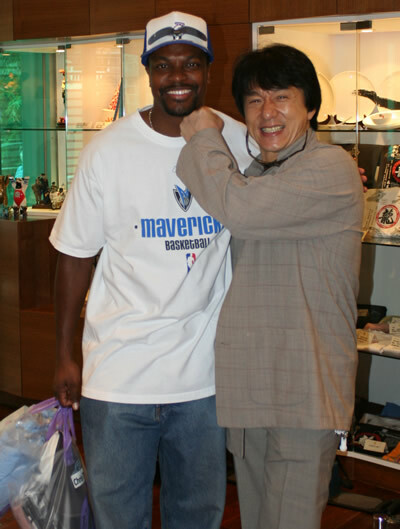 Over at the Hollywood Stock Exchange, stock in Rush Hour 3 is rising! Does that mean that some Hollywood insiders have hopes that the movie will be made? There has been a lot of talk about this movie, but nothing has been signed. But if we believe the stocks, then maybe we should keep our fingers crossed, right? 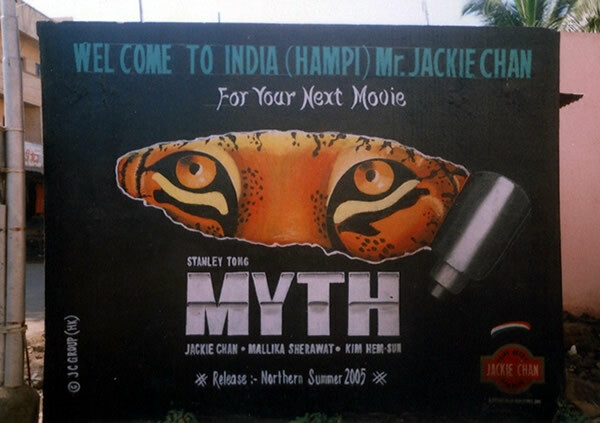 Have a look at the Kids Corner page dedicated to Jackie's new movie The Myth. You'll see a new poster, some publicity photos, and there's even a link to the really neat music video for the theme song, Endless Love. Click here to visit! Lots of new things to see about Hong Kong! Read about Stanley Market (and don't forget to check out Matty's Hong Kong journal, below. by Matty, Kids Corner friend! Our friend Matty from Australia was kind enough to share his beautiful photos and interesting written observations from his recent trip to China and Hong Kong. Click below to have a look. Thanks Matty! 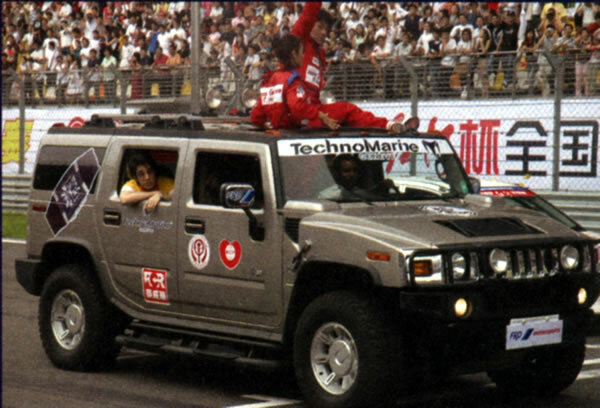 Now THIS is One DEVOTED Fan! This time you can read about Jackie's neighborhood. Now there are three entries in the journal. Click the banner below to see the index! 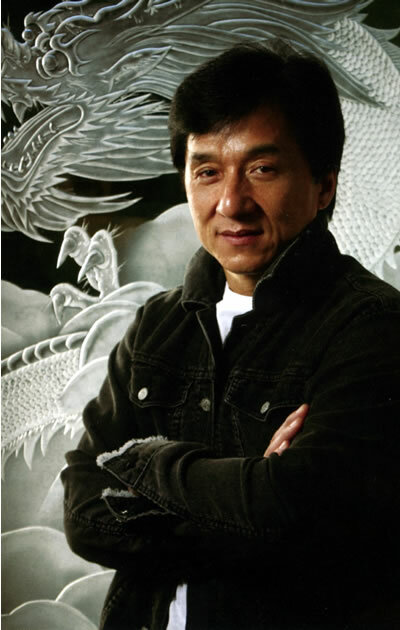 Most of you probably know that Jackie has opened a California Fitness Jackie Chan Sport gym in Hong Kong and that he is at the moment opening another in Malaysia. 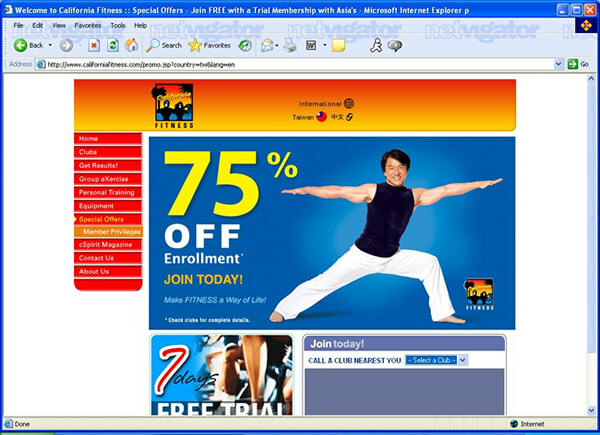 Check out the photo of Jackie on the California Fitness home site. Jackie is encouraging people to exercise more and wants to make exercise a family event. Click on Jackie to see the California Fitness site.